There are two really exciting fundraising events in March. 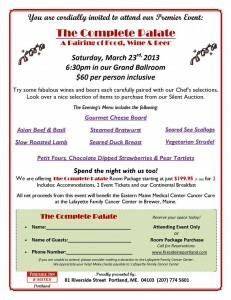 Both events will benefit the Lafayette Family Foundation and Lafayette Family Cancer Center in Brewer, Maine. 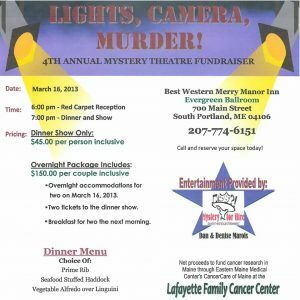 The Best Western Merry Manor Inn will host their 4th Annual Murder Mystery Dinner Theatre – “Lights! Camera! Murder!” on Saturday, March 16th at 6:00pm. Download the flyer here. The Event includes a Red Carpet Reception, Dinner and Murder Mystery Show. Dinner choices are: Prime Rib, Seafood Stuffed Haddock, or Vegetable Alfredo over Linguini. March 23, 2013 ***please note: this event has been postponed until the Fall. Please check back later for the new date. 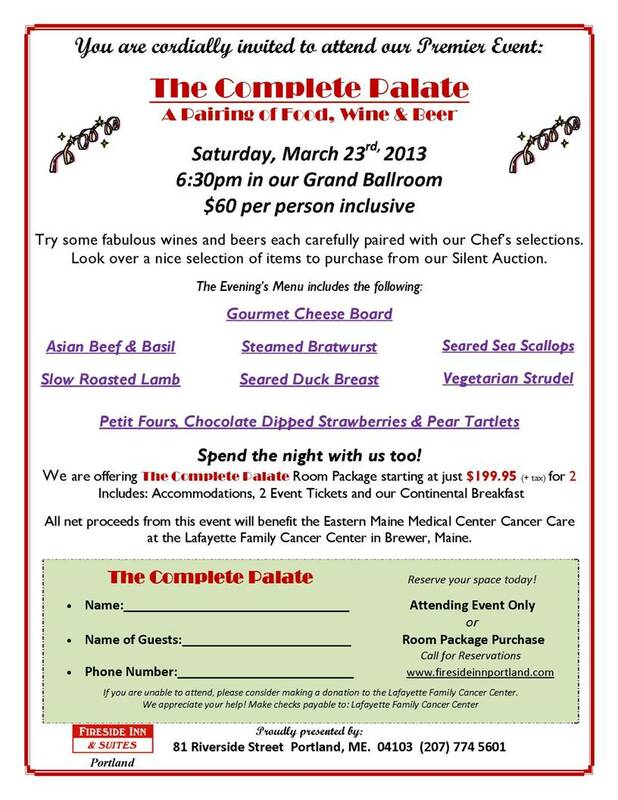 The Fireside Inn & Suites in Portland is holding the, “Complete Palate: A Pairing of Food, Wine & Beer” on Saturday, March 23rd. Download the flyer here. Try fabulous wine and beer selections carefully paired with the Chef’s creations. Menu items include: Gourmet Cheese Board, Seared Duck Breast, Asian Beef and Basil, Vegetarian Strudel, and more. Ask about their overnight rooms packages.